﻿ TDC - Plotting with Google Earth | Telonics Inc.
Telonics Data Converter (TDC) creates files that are compatible with Google Earth and Google Maps. GPS fixes and Argos locations appear as Placemarks in Google Earth. You can filter Placemarks to display locations for a specific time frame or locations of a specific type (e.g. Argos Class 1 locations or better). 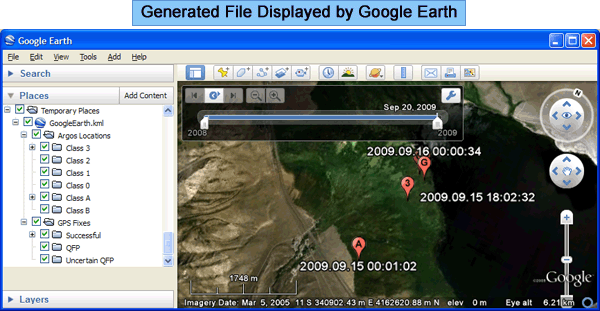 Google Earth provides tools to measure the distance between Placemarks or the distance of a path (series of Placemarks). You can record a tour of locations, allowing you to watch an animal migration. Google Earth can view multiple units at the same time. If you post TDC-generated files at the same time, you can easily display locations from multiple units at the same time. If you post TDC-generated files on the Internet, you can view the locations in Google Maps or Google Earth to display locations on your website, allowing you to share your locations with the world.